Order on GrabFood and wait for fresh sushi to arrive at your doorstep. Looking for a bite-sized meal that is delicious and bursting with flavours? You might not be surprised to find sushi to fulfil a convenient and casual meal, whether if you are eating it on the go or looking to have a nice, premium dinner. With Japanese food designed for convenience, it is no surprise that sushi restaurants have jumped on the bandwagon to deliver fresh sushi right to you. Think about enjoying maki rolls and fresh sashimi without the need to leave your seat or sofa. Sounds good? With that, here are 5 sushi restaurants that offer delivery services to your doorstep in Kuala Lumpur with GrabFood! This Japanese sushi chain holds a lot of fond memories for Malaysians because they have been a mainstay in Malaysia’s Japanese cuisine scene for a while. Known for their affordable quality sushi and other Japanese cuisines, they serve 3 main groups of sushi on their menu namely Nigiri, Maki or Gunkan. You can choose from Nigiri Sushi that includes Norwegian Salmon, Surimi Scallop or even the Ebi Ten. Opt for the plentiful Maki Sushi which includes the classic California Maki, Tuna Mayo Maki and the Kanikama (Crabstick) Maki. The Gunkan Sushi choices are plentiful too, ranging from Salmon Mayo, Chuka Iidako and even Yakinuki Beef. Other than sushi, Sushi King also offers mains like Donburi and Bento sets to supplement your sushi meal. Sakae Sushi is also another familiar Japanese sushi brand that we have grown up with, where their ingredients are sourced from top suppliers with a keen eye on the freshness, quality and nutrition. 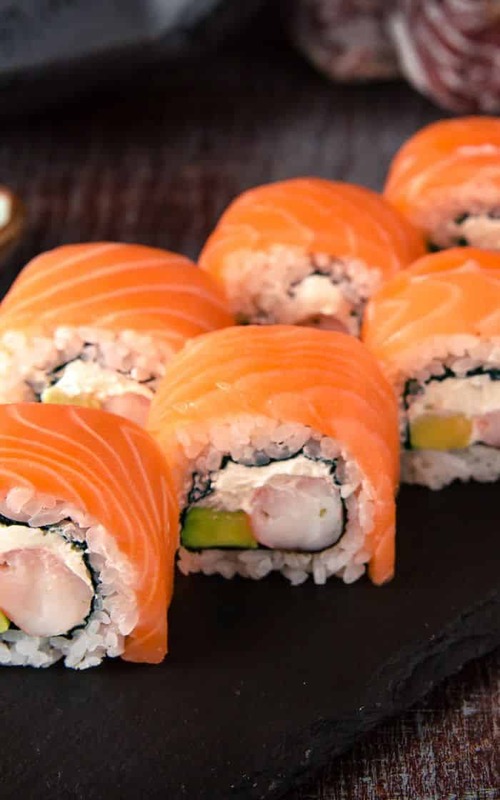 Even their rice used in the production process of sushi are infused with the healthy vitamin E. Thus, their must-try selections are the range of salmon sushi they provide. Sakae Sushi has made it easier with sets to go. Better known as Sushi Moriawase, the different sets available under this section contains the different sushi in different combinations at affordable prices. What better way to try different kinds of sushi? However, if you are looking for individual to-go pieces, there is a wide selection of 21 different nigiri sushi including Inari and Hamachi Sushi. Additionally, there are 12 types of gunkan sushi like Kani Salad Gunkan and Chilli Clam Gunkan. If that is not enough, standard make sushi set like Kani Maki to premium maki sets like the SPicy Ebi Tempura. 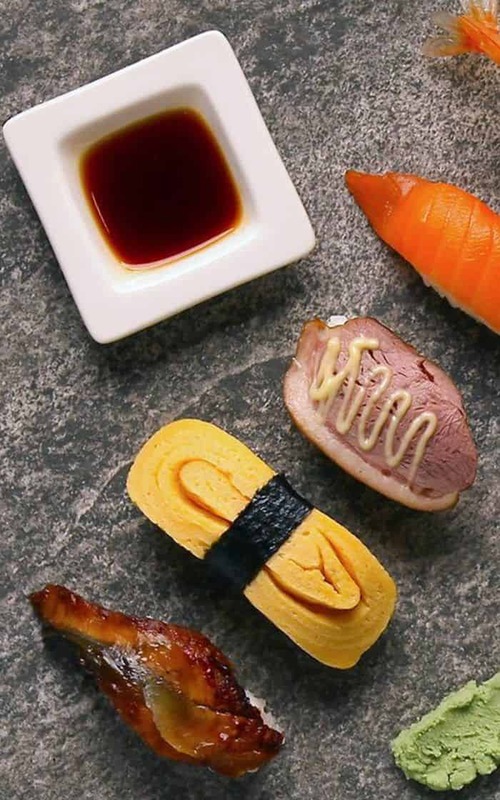 Lastly, a must-try unique selection is the Aburi Sushi collections where they will torch sear the sushi with mentaiko mayo, leaving an out-of-the-world feeling with every bite. Sakae Sushi has a huge number of sushi and sushi sets to try, time to get started. Sushi Q aims to serve a no-frills Japanese fast cuisine that is both fresh and delicious. With over 9 stores in operation, getting sushi without queueing is possible at Sushi Q. They offer standard sushi with a good variety with crowd favourites like the Tamago Sushi to Unique choices like Unagi Kani Maki Sushi. They even have varieties of Inari sushi, which is essentially sushi rice wrapped inside seasoned deep-fried tofu pockets, where they offer 7 different types of flavours like the Cooked Salmon Mentaiko Inari to the Scallop Lips Inari. They even have Box Sets that are already prepacked with different flavours like the quintessential Salmon Sushi Box Set to a more premium Lobster mayo Yaki Box Set. One of the strengths of Sushi Q is the wide offerings of sushi flavours but they also fare very well in offering warm food like ramen and donburi should you need it. 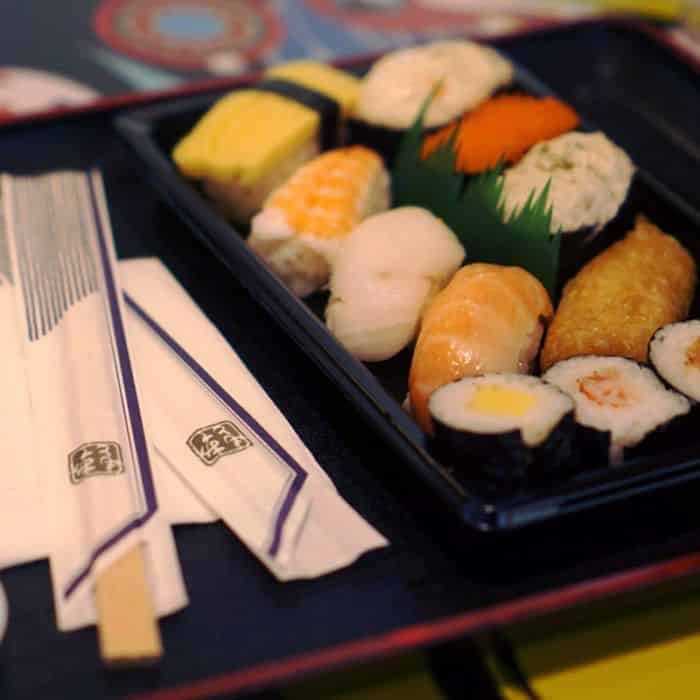 Sushi Go is known for being a fast-casual dining Japanese restaurant, where their selection of sushi are extensive and are within a reasonable price range, so you might not need to worry about burning a hole in your pocket. They offer 8 maki sushi selections that have the classic California Maki sushi to the more premium flavour like Soft Shell Crab Maki and Unagi Cheese Maki which is sure to fill your belly and satisfy your tastebuds. For vegetarians, you are not excluded here with their choice on vegetarian maki. Now, if you are looking for sushi sets to share with your friends, look no further with their 3 different sushi sets. The Nigiri Set centres around a good mix of Kani Sushi, Egg Mayo Sushi and many more. The Maki Set centres around an equal portion of maki sushi flavours like California maki, Tamago maki, Tuna Mayo maki and many more. Lastly, the Salmon Set is the prime choice for salmon lovers, with Fresh Salmon, Salmon Aburi, Salmon Cheese Maki and many more. 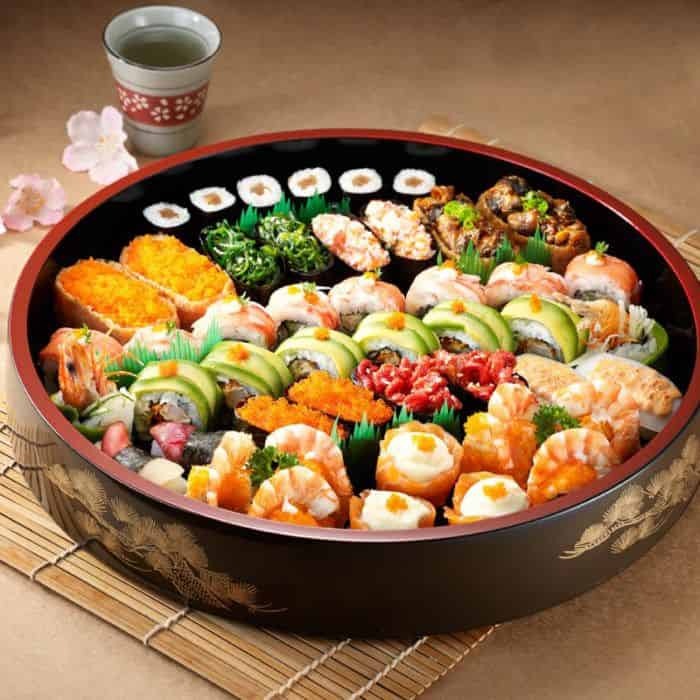 If you are looking to share a sushi platter, Sushi Go is the choice for you. Sushi choices are plenty among the 4 different restaurants but the good news for us is that delivery service is available for us. Simply log on to the GrabFood app, order online and wait for fresh sushi to arrive at your doorstep. All of the food choices and restaurants mentioned above are available on GrabFood today, thanks to GrabFood’s sushi delivery service. Try it today!